One of the most celebrated cartoon characters of all-time is most definitely Batman, along with his other compatriots in the Justice League. If you are a fan of this Gotham City superhero and or just an avid collector of character USB drives, you may have already heard about Mimoco’s newest product. Mimoco, the manufacturer behind tons of character-themed USB portable memory disks, has announced its release of a Riddler USB drive, one of the most memorable of Batman’s opponents. 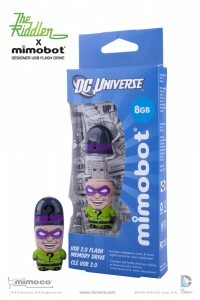 The partnership between Mimoco and DC Comics stems way back to CES 2011, the time when Mimoco first introduced USB drives that were designed in honor of everyone’s favorite DC characters. Now, the family of Mimoco’s comic book-based storage devices has grown even bigger with the addition of the Riddler to its current line-up. The company aims to add to the nostalgia of owning one of the limited edition USB devices by adding the trademark question-mark symbols all over the Riddler’s well-recognized green suit, as well as giving him his signature purple and white mask. “In the New 52, The Riddler has been rebooted and re-stylized and now rocks a green mohawk in the shape of a question mark,” Jessica Smiley explains. “But we here at Mimoco love the classics so our Limited Edition The Riddler X MIMOBOT is just that—classic. Among the popular DC comic book characters, Mimoco USB drives currently include Batman with The Dark Knight Rises costume, Bane, Superman, and the appropriately named, The Flash. All of these designs come with a maximum storage capacity of 128GB, and are compatible with both USB 2.0 and USB 3.0 ports. All DC-inspired USB drives come equipped with the MimoDesk personalization software, which allows the user to select themes, avatars, and wallpapers depending on the character of the flash drive. The Riddler, as most of you may remember, is the enemy of Gotham City. What he famously does is take in hostages and do evil crimes and leave clues and riddles for our favorite dark knight to solve before time runs out. Even haters of the Riddler would find it cool to bring this villain around. 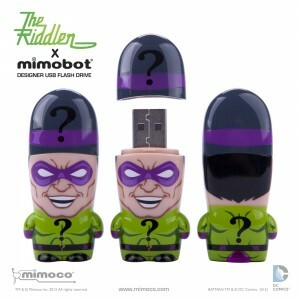 If you are interested to place an order, visit Mimoco’s website as soon as you can as the company has announced earlier that it will only be producing 2,000 pieces of the Riddler USB so we suggest you put your order in before stock runs out. This entry was posted in Mimoco and tagged 2013, Batman, Custom USB Drive, MIMOBOT, Mimoco, The Riddler, USB Flash Drive. Bookmark the permalink.